The DMD program will educate students to become competent dentists, dedicated to serve the community and will practice dentistry with the highest level of ethical and moral standards. The curriculum focuses and emphasizes the importance of research and encourages student participation in research activities. This program is tailored to meet the needs of the dental students in the region. Goals, outcomes, effectiveness and curriculum practice, prepare a generation of general dental practitioners with clinical competency; produce graduates who possess the knowledge, skills and values to begin the practice of general dentistry serving citizens in UAE or any other geographic location of their practice. 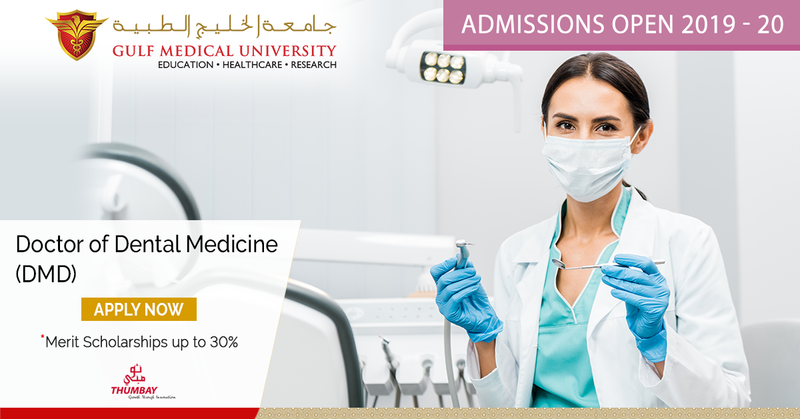 Maintain a high standard of dental education, research and services. Produce competent, confident and high employable dentists. Widening access to higher education by producing highly competent graduates that are capable of carrying out postgraduate studies at local and international universities. Enable graduates to develop their capacity to learn and to become independent learners. Provide broad based scientifically strong education in dentistry that equips the graduates to enter all areas of the profession and to adapt to changes that may occur during their professional life. Produce graduates who are able to communicate and deliver dental care both in community and hospital settings. Ensure that students acquire clear understanding of their professional and ethical responsibilities towards their communities and humanity at large. Participating in the process of improving and implementing oral health care in UAE in cooperation with public and private sectors. Cooperating with local and international dental education and research centers in the field of research in order to enhance scientific knowledge in oral medicine and dental health care. Participating in local and international scientific meetings. The Vision of the College of Dentistry is to be nationally prominent in Dental education, research and service and merit international recognition for quality in education, research and service. The applicants from UAE education system offering Advanced Track/Stream or Abu Dhabi Education Council criteria must have secured an overall average of 80% or above marks as per UAE Secondary School Education Standards and should have scored an aggregate score of 70% or above in Biology, Chemistry, Physics / Mathematics in the 12th Grade. (Advanced Track/Stream or Abu Dhabi Education Council criteria) Student should secure an overall minimum score of 80% (B Grade) and above in the 12th Grade. o An aggregate score of 70% or above in Biology, Chemistry, Physics / Mathematics in the 12th Grade. India Indian State Board Student should secure an overall minimum score of 60% and above in the 12th Grade. o An aggregate score of 60% or above in Biology, Chemistry, Physics / Mathematics in the 12th Grade. Indian Central Board/ICSE Student should secure an overall minimum score of 55% (B Grade) and above in the 12th Grade. o An aggregate score of 55% or above in Biology, Chemistry, Physics / Mathematics in the 12th Grade. Bangladeshi Board Student should secure an overall minimum score of 55% and above in the 12th Grade. USA American Diploma Student should secure an overall minimum score of 80% (B Grade) and above. Applicants from any other non-UAE educational systems not listed above must have secured a minimum aggregate score equivalent to UAE 80%or above as per International Grade Conversion Table published by WES. All applicants shall be evaluated for cognitive and non-cognitive traits demonstrating their aptitude for the chosen area of study by the Admissions Committee which includes Multiple Mini Interviews (MMIs) and personal interview. Admission is finalized on competitive basis.